Toba also has a number of islands nearby which are accessible by ferry. The two larger islands are Toshijima and Sugashima. Kamishima is a smaller, more remote island. 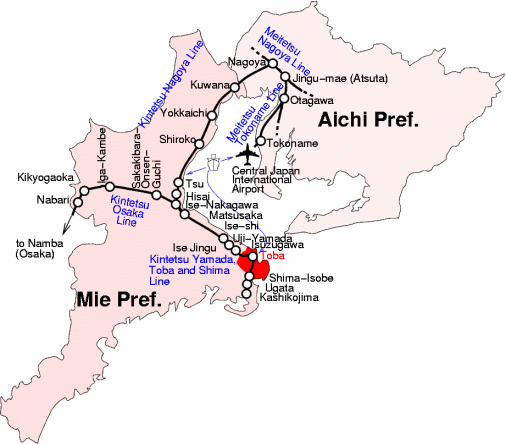 Ise is located about one and half hours from Nagoya and just less than two hours from Osaka by Kintetsu train. The center of the sightseeing is Ise Jingu Shrine. Jingu means God's Palace. When traveling around Japan, you find there are large numbers of jinja shrines. Jinja which has a historical and honorable origin was given the name Jingu. There are only several Jingu in Japan. In addition, when you say only "Jingu" without proper name, you indicate Ise Jingu. Ise Jingu is in the class of its own. Ise Jingu consists of 125 shrines including Toyouke Daijingu (usually called Geku), Kotai Jingu (usually called Naiku) and Betsugu. When visiting Ise Jingu, first visiting Geku is a custom from ancient times. Oharai-machi / Okage-yokocho Oharai-machi has prospered as a cathedral town of Naiku. Oharai Dori Street is 800 meters long from Uji Bridge along the Isuzu River. Souvenir shops, well established confectioneries, restaurants and inns line the street and attract visitors all round the year. Futami The place name Fatamiga-ura is derived from a myth that Yamatohime-no-mikoto turned her head to take a look the landscape twice because it was breathtakingly beautiful. "Futami" literally means looking twice. Its landmark is Meotoiwa rocks and an even coastline can be seen to west from the rocks. Futami flourished as a town where visitors purified themselves before they visited Jingu and as a town where they also stayed. Toba Aquarium This aquarium is one of the largest aquariums in the world and is divided into 12 different zones, depending on kinds of environments in which creatures live. Now there are 850 kinds of aquatic lives are on display for visitors. The aquarium has various successful breeding programs and a baby Indian porpoise was born here for the first time in captivity. Nautiluses are also bred and a second generation of the sea otter was born in captivity for first time in Japan. Toba Aquarium has bred a pair of dugong and this is a world first. You can watch a sea lion show at the performance studio and will be surprised to learn what versatile entertainers sea lions are. Mikimoto Pearl Island This is a theme park where you can understand all things about pearling industry. Kokichi Mikimoto succeeded in creating the world's first successful cultured pearl here in 1893. The Pearl Museum displays the process how to produce cultured pearls and jewelry. Mikimoto Kokichi Memorial Hall introduces the life of Kokichi Mikimoto, the legend of the cultured pearl industry. You can eat and enjoy shopping at Pearl Plaza. You can see demonstrations by "ama," which are the female pearl diver and were crucial too the pearl cultures success.